Using physical exam findings, history of disease and imaging modalities, several classification schemes have been proposed to stage lymphedema. Perhaps the most widely used is the International Society of Lymphology staging system. 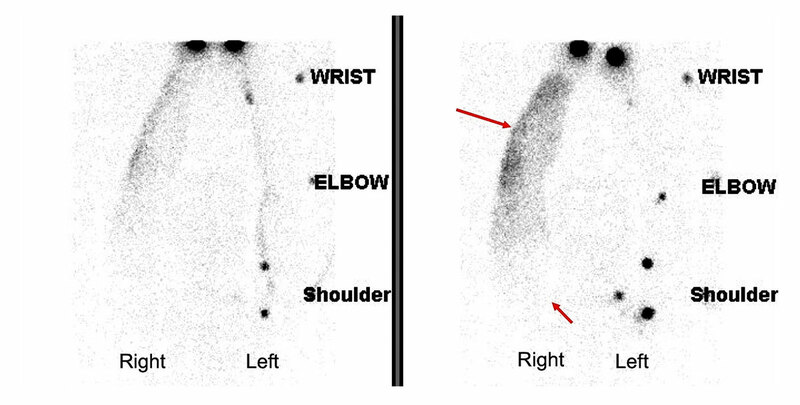 But this staging system is based only the clinical symptoms, but no objective measurement or imaging assessment. As our understanding of lymphedema has evolved and technologies improved, other staging systems based on clinical presentation, circumferential measurements, objective measurements, lymphatic imaging or a combination thereof have been proposed. 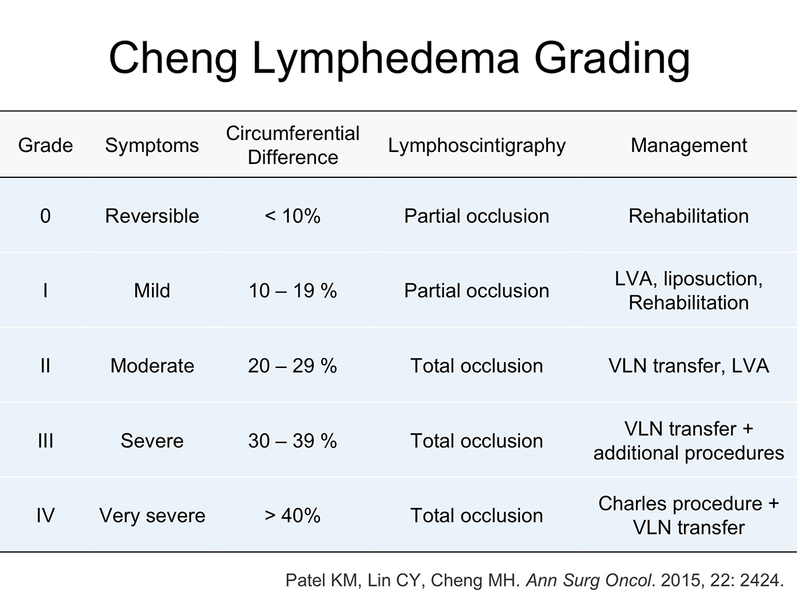 At our center, we use the Cheng Lymphedema Grading system based on symptom severity, circumferential difference, and lymphoscintigraphy imaging to determine appropriate treatment, which was published on the Annals of Surgical Oncology, a renowned journal: A Prospective Evaluation of Lymphedema-Specific Quality-of-Life Outcomes Following Vascularized Lymph Node Transfer. (Patel KM, Lin CY, Cheng MH.) 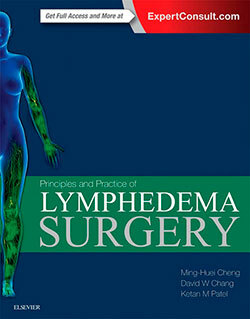 and book: Principles and Practice of Lymphedema Surgery. Cheng MH, Chang DW, Patel KM (Editors). Elsevier Inc, Oxford, United Kingdom. ISBN: 978-0-323-29897-1. July 2015. Data source: Principles and Practice of Lymphedema Surgery. Cheng MH, Chang DW, Patel KM (Editors). Elsevier Inc, Oxford, United Kingdom. ISBN: 978-0-323-29897-1. July 2015, page 204. Dr. Cheng is the author of the Cheng Lymphedema Grading System with integration of Taiwan Lymphoscintigraphy Staging which was published in Annals of Surgery (the top Surgery Journal) in July 2018. 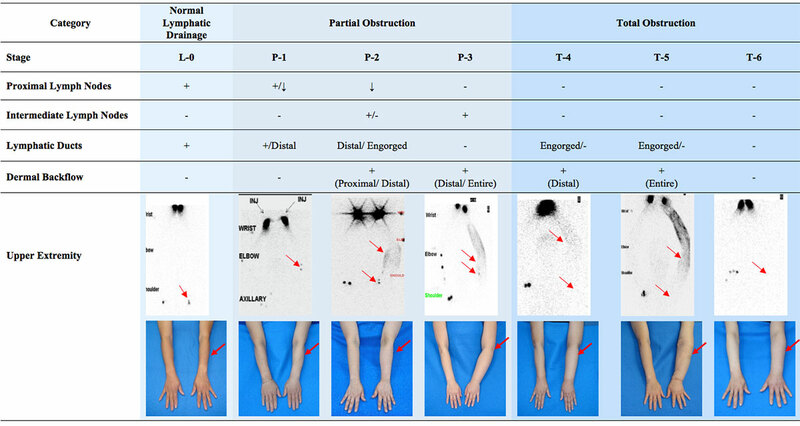 The Cheng Lymphedema Grading System with integration of Taiwan Lymphoscintigraphy Staging, a comprehensive objective assessment tool that analyzes lymphedema symptoms with quantitative measurements and advanced imaging technology, can effectively help physicians evaluate the severity of lymphatic obstructions, determine the accurate diagnosis, select the most appropriate procedures to treat lymphedema, and ultimately ensure the favorable functional outcome and finest quality of life for lymphedema patients.